Darlinghurst Theatre present GOOD WORKS by Nick Enright at the Eternity Theatre, Burton St, Darlinghurst November 4 -29. The Darlinghurst Theatre and the Enright Family have joined together to produce a-play-a-year by Australian writer, Nick Enright. Last year they produced together DAYLIGHT SAVING, next year, A MAN WITH 5 CHILDREN. In the Eternity Playhouse Iain Sinclair has Directed Enright's GOOD WORKS (1994). GOOD WORKS presents the story of two families over a 50 year span, of particularly, two Australian girls/women growing up in a country Australian town in the 1930-50's with all of the attendant and affecting social, cultural and political mores of those times. Its ambitions and inhibitions, its visions and prejudices. Its aspirations and prohibitions. Its grace and its hypocrises. Its love and its violence. Of two young women from the opposite ends of town who make friends at school - Mary Margaret (Lucy Goleby), an adopted young woman brought up in the disciplines of the Catholic Church with its religious precepts, practices and its social restraints, inspired to do good works, to ensure a 'heavenly' life on earth and for another one in the afterlife; and Rita (Taylor Ferguson), a wild 'thing', an adventurous, but innocent, iconoclast embracing the world and any opportunities about her to be 'happy', even at the risk of the expense of forbidding judgement and ostracisation. Both bearing the resultant burdens of their chosen paths. Both under the pressures of their culture and so, misunderstanding and 'punishing' each other and themselves to find the 'way'. The play tells, as well, of two young boys/men Shane (Anthony Gooley) and Tim (Stephen Multari) weathering all those 'slings and arrows of outrageous fortune' of 1950's Menzies' Australia, through not fault of their own, but by being part of a discriminated minority from all aspects of their world, whilst pursuing life, liberty and happiness, their inalienable rights, and groping for that solace, and being frightened of where, with whom they intuit, they may find it - with each other. Homosexual in the 1950's! - does much change, has it changed that much even today, in those country towns, outer suburbs? In a dazzling time structure puzzle the play moves through and back on time with precipitous dexterity, requiring the actors to shift ages, and even more demandingly to create other characters in the blink of an eye. The physical and psychological skills that the actors must bring to the fore must be swift and demarcated with absolute precision, embedded in real body, rehearsed, muscle memories. Jamie Oxenbould has the responsibility of four characters; Toni Scanlon has three and they handle them with much aplomb. Too, Mr Gooley and Multari take on two characters each, and All must move through appropriate age changes. Mr Sinclair and his company manage this with astounding skill, and 'teach' us, the audience, how to keep up - what to watch for to keep the story fluid and clear. The sheer technical feat of these actors is admirable. Hugh O'Connor has created with and for Mr Sinclair, a set of vertical, circular columns of varying heights, on which the actors move to assist with the different characterisations/time shifts and adds, unconsciously, the sense of danger and courage of these individuals as they negotiate their life directions, decisions. Besides 'illustrating' the actors' courage in the breathtaking risk of falling that they are undertaking in their movement on and about the Design elements (much like the dangerously precipitous Set Design for Griffin's recent THE BLEEDING TREE - one does wonder if the Directors are aware what difficulties they have given the actors for that aesthetic choice? And how much time have they [ the Director] spent on the actual set itself to ascertain that - climbing, jumping, stepping, thinking, acting, etc all at once? Are actor's sometimes too 'supine' to protest? That their need to stay in work prevents them from too much protest - not wanting to be known as to be difficult? It does look dangerous!) 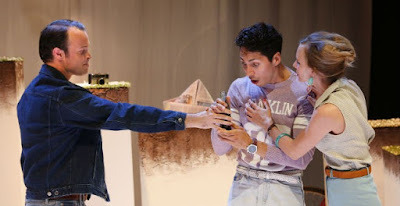 The Lighting Design by Sian James-Holland attempts to assist similarly with the demands of the time exchanges in the play but only succeeds fully, occasionally - the focus is not always tight enough or the light covering accurate enough. Nate Edmondson is in charge of the Composition and Sound Design. Ms Goleby draws a most satisfactory arc of character journey with a sense of centred calm (reveal) in her work which is, I think, new to her armoury as an actor (I last saw her in Sydney in A MOMENT ON THE LIPS at the Old Fitz). Ms Ferguson who gave her stage debut in Sydney as an outstanding MISS JULIE, two years ago, re-enforces her impression as an extraordinarily interesting artist - there is danger and strength in every moment of her choices on stage, which is supported by a vital intelligence and sweeping intuition - it all looks and sounds so spontaneous, it is mesmerising for its sense of danger. Mr Multari, too, seems to be becoming freer with every outing he has, whilst Mr Gooley delivers with his usual sureness of touch. Much credit must be paid to both Mr Oxenbould (who we saw early this year in a welcome turn in THE DAPTO CHASER) and Ms Scanlon, who both give such accurate and 'juicy' support to the many tasks they have in this play. I am full of admiration for the form skill of Enright's play as I was with DAYLIGHT SAVING last year, but have the same feeling of dissatisfaction with the content, the 'guts' of the play. In this case we are shown the causes and affects that this world has on these human beings and it seems very authentic (I remember the era, too) but there is very little reveal/interrogation about the 'issues' of the play. There appears to be an absence/avoidance in the writing to explain/justify/be critical of the world of which he writes. I was not enlightened at all, I felt that all that had occurred was a showing of a world of hypocrisy and pain. A kind of dry 'history' presentation of shocking facts. And, certainly, the revelations of the Royal Commission into Child Abuse can be better understood after watching this play and seeing the prevailing accepted outlooks/acceptances of behaviours in this period of time. I don't know whether in 2015 that what this play gives us is enough to create any deep satisfaction today. I wonder if it was even enough in 1994? Maybe, in Australian terms, the shock of the landscape of the play was sufficient to garner attention? However, on the other hand, the technical/cerebral solving of the writing's 'formulas' is impressive, as it was with DAYLIGHT SAVING. Indeed, I am very curious, will be very interested, to see how A MAN WITH 5 CHILDREN stands up in 2016, for I recall, I thought when the play was premiered at the Sydney Theatre Company (STC) a decade or so ago, it was the bravest Mr Enright had been in his writing revelations - the most 'naked' he had come to revealing/interrogating the writer's concerns/experiences in a public space. I saw Enright's A PROPERTY OF THE CLAN a few months ago, and felt that it was a very good play. Tight, provocative but still simply showing the facts of the story with very little debate. As a Theatre-in-Education exercise it was enough, you could feel the hanging instruction in the theatre/classroom: Now let's discuss. Let's interrogate the 'issues' of the play for our society. When in his expansion of that material he wrote BLACKROCK, it was a less impressive work, its sentimentality tipping it into a less agile observation, and still avoiding intense confrontations with the material. The Direction, the performances in GOOD WORKS at the Eternity Playhouse are worth attending to. The play as a whole, as an holistic experience, less so, for me.